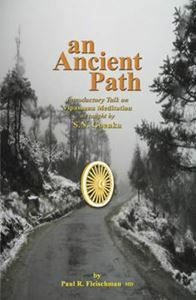 An Ancient Path: Introductory Talks on Vipassana Meditation By Paul R. Fleischman The talks collected in this book were given to varying audiences under unique circumstances that partly shaped what was said. This is not a collection of essays. The talks stand side by side, all having the same center, which is reached from a different angle each time: The Boston talk was to mental health professionals in the USA. The Freiburg talk was given to “Mindfulness” researchers in Germany. The Madrid talk was given in a hospital, with a translator, that slowed and limited its length. Before the Vienna talk, Paul Fleischman was advised to speak as if the audience had a pre-existing, intellectual knowledge of Buddhism, and was asked to specifically address the topic of “Karma and Chaos.” Before the Dublin talk Paul was admonished to give a literary and intellectual cast to the presentation. In Ghent he was asked to speak to a University audience with a more philosophical background.